Well, I'm not referring to my recent flights nor the upcoming legalization of Marijuana in Canada, but more so to the ongoing summer wild fires and the smoke impact on recreational flying here in British Columbia. By all means, maybe having a "legal toke" after this summer might ease the mental pain momentarily, but it certainly won't cure the financial losses incurred once again by tourism, recreation, aviation, in short the fun things folks usually do in the summer and spend money on. Like flying Ultralights and getting their licenses. On a positive note, here in the southern Cariboo we didn't get evicted this summer and while the smoke got really thick (sickening thick) and parked pretty much anything winged & rotored once again, it wasn't as bad as last year. So keep calm and close the shop doors. 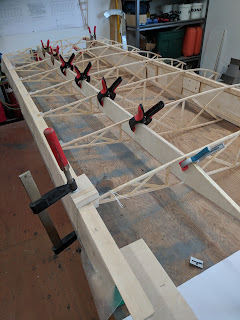 Certainly, if I have a choice, stick and rudder always sounds better than chisel and glue but such is the "New Norm" as they call it now. Winter jobs become summer jobs and winter really has become almost the prime season for us to fly, teach, and play. I cannot stress enough all the good points about winter (ski-)flying here in the Cariboo. Lakes! Lots of lakes being one of them! With towns, resorts, restaurants and gas stations along these lakes, it's never too far to jog across the road with a Jerry-Can to get more gas for your next leg in the journey or have that much needed warm up coffee and burger. Ever been ice fishing, snow-shoeing, or visited a trappers cabin on a secluded lake only ski planes can get too? 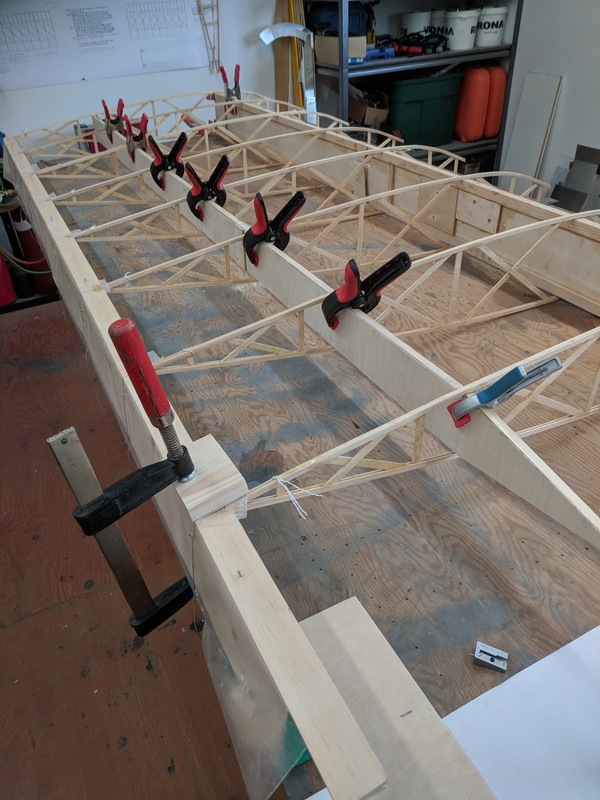 Ever gone out with a group, gaggle, flock, pack, murder, or whatever you'd like to call it, of ski planes? Fun, Fun, Fun! Our Cariboo Ski Fly In Week last winter in February, coupled with a TC approved Refresher Course was a great event and I do believe we can make it even bigger and better this year. 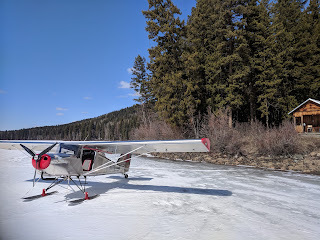 While there are no plans on a TC Refresher for this season, we will extend the actual "Cariboo Ski Fly In" to 10 days over a two weekend period. This will hopefully allow for weather and also have more time for folks to join from further afield. If there is sufficient interest, turn out and participants I'd be more than happy to organize some guest speakers for evening talk sessions and presentations. Furthermore, we will once again work with CZML and have the Snow Runway at the South Cariboo Regional Airport. We do have the 108 Resort and Hangar Restaurant for accommodations and meals available ramp side. Group rates will require some upfront commitment, so how many can we get? 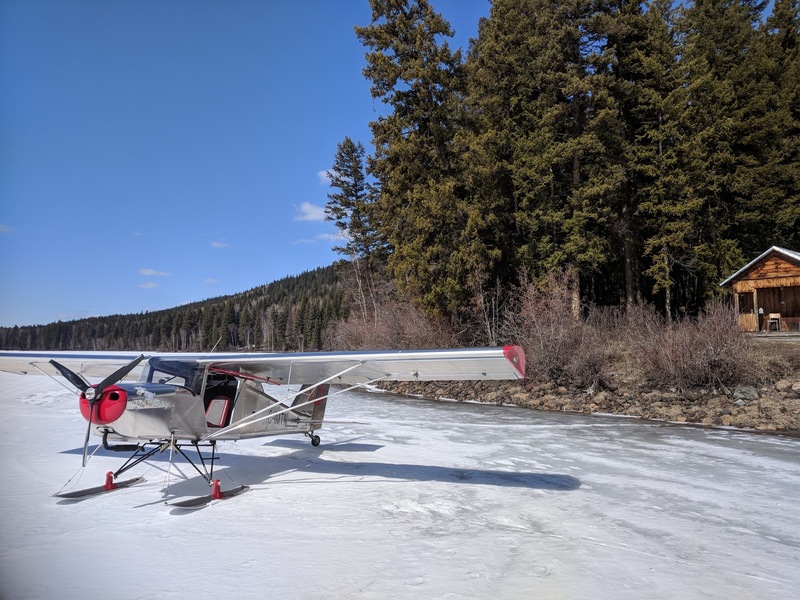 As for "Snow How" training, our BushCaddy R80 (Nellie), is finally up and running as of last winter. She has performed flawlessly all summer. With the Federal 1500 Skis it does make for an ideal and roomy trainer, especially with those thick winter coats. Did I mention it has a nice heater? Some of you might wonder, why the change of heart? Let me start by saying that we have been working in recreational aviation, commercial aviation, aviation related aviation work for the better part of our lives. Aerial Escapades is now in it's 21st year. Before that, there was Sky West Adventures and Eagle River Aviation in the Shuswap. In between there was Ten-ee-ah Aviation Ltd. operating as a 702/703 charter service. So yes, some 30+ years in there comes the occasional doubt of "..how much longer"? Add to this the loss of several friends on the commercial side of things and doubt starts battling passion. BUT, flying is a passion for me, us really, and this has manifested itself in most everything we do today. We have literally built our lives around this endeavour and over the years can look back on some amazing flying trips and adventures with wonderful people who share the same passion. Last but not least is our loyal following that keeps us up and running. With their friendship, encouragement and their repeat bookings, business from the shop, training, rental and whatever crazy adventures we decide on next. Thank you! It is really you who keeps nourishing this passion. Please note that all bookings in our Suite are on a first come/first serve basis! Visit us on AirB&B for more information or to make a reservation. It's not an easy task for any one man to follow and update the maze of social media platforms that are bombarding us every day. In an effort to bring everything from Facebook, Pages, WeChat, Messenger, Google+, Webpage, WhatsApp, Messages, Blogger, Hangouts, and you name it under control and under one roof, I have decided to reduce the places you will find information and updates into just a few. In order to do this, it will be separated into the static part such as our webpage and the dynamic part, this being my new blog and the occasional Google+ updates. In time it will all be Google based. Why Google, you may ask? Aren't they just the worst? ..well to be honest they all are, but remember we all have a choice where to post, not to post or post privately and/or turn off our mobile phone, this constant personal tracking number we all have willingly chosen. I wont get into the paranoia of being tracked every step of the way, as far as I am concerned they, whoever "THEY" are, can full well know that I get my food from SaveOnFoods and I occasionally shop at Canadian Tire. Go ahead, track me, I'm just the another grey mouse in the system that covers millions, billions of folks on this planet. I doubt that at the end of the day its really that interesting what I shop for or post for that matter, with the exception for the likeminded few like yourselves that are actually reading down this far on my literary ramblings. Now if you have an extremist view on government, religion and society as a whole and want to spread this hate publicly than, in my honest opinion, maybe you should be followed and followed closely. As for the few ol' guys and gal's enjoying some skiing, hiking, fishing, kite boarding and recreational flying, ..doubt we are of much interest to the super conglomerates, especially if you're as frugal as a Scottish Senior with a Swiss wife. The other real reason is that Google has become a great overall platform and what used to be a simple search engine and email thingie has entered the global stage to compete with ease, I may add, with the products such as Windows and most of all Apple. As a long time Apple user I finally switched last year, getting tired of some of the proprietary system they are applying and picked up a Google Pixel phone. The rest is history as one would say. How much easier can it get? Yes there is a few apps that I really like such as FotoMagico, iMovie, but Android based apps are out there and there is not only one but there is choice. But who knows, maybe in 15 years I may find myself at the same place as I did with Apple a year ago. If you are still reading this and haven't grown tired, (you should really hit the follow button now) here is my thinking; can't leave Skype, I subscribed early on and it still has it's merit today as Google Voice is only available in the US and Hangout's doesn't do what Skype does. - correction, Hangout's Dialer does it! I will have to try it out, before I'll change. Next is WhatsApp; well Euro's love it because it's not Messenger or Facebook, ..really?! It's encrypted end to end, so Mr. Zuckerberg testified to the Senate hearings, but it is still one of his products, hmm, not sure yet on that one and thus far it still works on my phone. WeChat probably is my all time favorite and using it extensively in China, you gotta love it. Are you being watched you ask? I'd say no more than the usual NSA, CIA, CESIS and all the other 3 or 4 lettered conspiracy entities that are part of making (you paranoid) our lives so safe. It stays, too many friends in China that can't get Google and its products. So this means that Facebook, Pages, Messenger (Skype?) are going on the dynamic end and most likely our webpage is to follow on the static end in not too long. It will be a bit of a process and re-shuffling and certain contacts will not be crossing over. I realize that and accept that! At this point I'd like to thank all those who have moved over, subscribed as followers, are still me friends even though the format has changed. Let me remind you that this platform is as dynamic as the world around us, by all means a work in progress, ..so let us boldly go and see where it takes us! A New Dream turns Nightmare, ..again! For more Info - Click below!